I try very hard not to hold a grudge. I know how much energy it wastes. Worse yet, while I’m wasting energy and feeling miserable, the person on the other end of the grudge is blissfully unaware of it. Someone dear to me once told me, “don’t let someone take up space in your head without paying the rent.” I’ve remembered that and try to live by it. Last year, someone who I had to deal with on a regular basis did some things that made me angry, then they said some things that hurt my feelings. The result wasn’t pretty. To his great credit, he has extended an olive branch and tried to mend fences on several occasions. Although I said the words, “I accept your apology,” the truth is that I never really let go of the incident. I went to the gym this morning to run a couple of miles on the indoor track. I set my app to remind me to run for two minutes then walk for 60 seconds. My favorite playlist was playing, I felt “fast” (for me), and I was having a great run. The first half of the 2 mile run was great. I thought about what I would do when I finished my workout. I thought about the fun I had over the weekend. I could feel the grin on my face. People were smiling and waving. Then, at 1.27 miles in (I happened to look at my running app), last year’s “incident” popped into my head. As soon as I thought about that person and what had happened, I got frustrated. I mentally told myself, “you must forgive him.” I tried to just say the words, “I forgive,” and I couldn’t do it. I felt I wasn’t ready to forgive him. I somehow NEEDED to continue to be angry with this person. I felt my mood continue to darken, and realized that I had begun to scowl instead of smiling. I continued to argue mentally with myself for a few more minutes, and grudgingly thought, “I forgive you.” I continued to run/walk and soon I began to think of possible ways to not mend fences with this person (fences keep people out), but instead to build bridges. I felt the bounce return to my step and the smile come back to my face. I finished my run, got back home, and I got curious. I pulled up the chart of today’s run and scrolled the bar to 1.27 miles. While I was filled with anger, I was slower. You can see it clearly. I went from “green” peaks to only “yellow” peaks as soon as I began harboring resentment. Stewing on old hurts slowed me down. I was 37 second slower on mile 2 than on mile 1. I couldn’t ask for a clearer demonstration of the power that negativity / anger has over me. It kills our joy, saps our strength and robs us what we are working to achieve. Thankfully, I feel much better. It’s my turn to extend the olive branch. I will never again underestimate the destructive power of internalized anger. Easters were special growing up. We colored dozens of eggs. Mom made homemade candies and molded bunnies. I wore a new dress every year. Some years Mom made the dress for me. The white shoes came out of storage (forget Memorial Day!) and we posed for pictures in the back yard in our finest. My Aunt would buy bags and bags of the left-over Easter candy and a week or so after Easter, we would have a big candy hunt with all of the cousins. Life was simple. We didn’t always attend sunrise service, but I remember being excited to go. Some years, it would be very cold, and I would insist on wearing my thin Spring dress (often sleeveless) no matter how loudly my teeth chattered. Although I can vividly remember some of those dresses (and the hand-crocheted shawls Mom made to go with them), I cannot remember the sunrises. In my imagination, they were vivid – as we sang hymns, the bright ball of the sun peeked over the horizon and the angels sang. In my imagination, it was quite a spectacle – worthy of motion picture awards. This morning, My dear sister-in-law and I decided to go to sunrise service. It was cold (low 40s), and the service was being held on the shores of Lake Erie, where ice covered the water mere days ago. I had no Easter dress, and as an adult, common sense ruled and I wore my heaviest wool pants, two sweaters, a winter jacket and woolen socks under my winter boots. I carried a travel mug of steaming coffee. I was prepared. The rest of the early morning worshipers dressed like me. Nary a light spring dress with bare arms was to be found. In the pitch black darkness, we sat on rough wooden benches, our backs to the frigid lake. As the service began at 6:45 a.m., the sky began to lighten just enough to read the prayer on the bulletins we were handed. This account lacks the drama from the Passion Play. Mark doesn’t tell us about Jesus’ appearance to his followers. There are no vivid beams of light streaming from the empty tomb. No heavenly chorus – no trumpets – only frightened women fleeing. As we said the closing prayer and sang the remaining hymns, the sky continued to brighten. There was no startling contrast, no brilliant colors. The lake didn’t sparkle. It was quite dreary (and still very cold). Pastor told us how some evenings when vespers is held at the same location, the sunset is stunning. Other times, like this morning’s sunrise, it is just a subtle transition from one day to another. After lunch, the children scampered through the yard looking for brightly-colored plastic eggs filled with candy. While I was inside the house being busy, the day had transformed completely. The cold had disappeared and the sun shone brightly. It was too nice to go back into the house, so we visited on the front porch. It was a wonderful time. With the last of the family guests gone, I took my opportunity for that quite contemplation that I missed earlier. I donned my running tights and shoes and headed for the high school track. I reflected on the cross, and the excruciating pain that would be involved in crucifixion. I remembered Christ’s pleas for forgiveness for the people who were torturing and killing him. I imagined the empty tomb, and this time my mental movie included this morning’s subtle sunrise, as the black night gave way to the soft gray of a cloudy morning. My own life has changed a lot in the past year or so. It’s been a slow process. Some days I am disappointed that the changes aren’t mind-blowingly vibrant. Other times, like today, I am grateful for the calm that fills me when I’m alone with the only sounds being those of nature around me and my feet striking the pavement. As I took my final lap around the track, the sun began it’s gentle descent toward evening. The bright ball in the sky was too bright for me to capture with my iPhone camera. It was the kind of light that chases away any kind of sadness left in the corners of your mind. I sat in the car and watched the light. It was the kind of brightness that would be perfectly accompanied by angels’ voices and trumpets. It filled me with awe, and calm. Last week was difficult. My mind was occupied with current events and political thoughts. I spent energy uselessly pondering issues that are beyond my control and problems that aren’t even mine to solve. While I was alone, in that moment, none of it mattered. My subtle sunrise brought me calm. 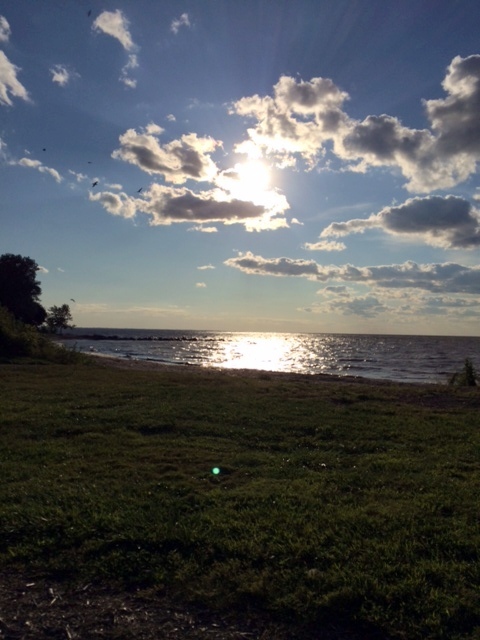 The light that ensued brought me joy – and peace. The emotions today brought with it may be lost in translation, but the message for me came loud and clear – even a dreary, subtle sunrise can become a breathtaking day. As the Easter hymns of my childhood echo in my mind, I am filled with joy. I took back my life a little over a year ago. I began exercising regularly, I improved my diet, I made a vow to try to focus on the positive instead of the negative, and my life has improved drastically as a result. Although I am still quite overweight, my health and fitness have improved to the point that most of my limitations are gone. It’s a great feeling. I’m encountering a new phenomenon online (not in my personal life yet) in which a once unhealthy individual is being shunned by friends after adopting a healthy lifestyle. That’s “fit shaming.” I don’t know whether the shunning is due to the individuals’ unpreparedness to face their own health issues or whether it’s because the newly fit person talks a lot about her new lifestyle (I know I’m certainly guilty) and the old friends can’t relate. We’re all people. We all have strengths and weaknesses. There are people in my life who are suffering from lifestyle-induced illnesses just as I was. I accept them as people – not “fat” people. There are people in my life who get tired of hearing about my runs and races and my new shoes, I’m sure. I’m fortunate that they still talk to me anyway. I feel accepted. Most of the time I felt loved and accepted at 300+ pounds. I don’t think people like me more or less because I’ve lost weight. I’m not ashamed of where I am. I’m not ashamed of where I was. Every step of this journey teaches me more about myself and about others. Fat or fit, gay or straight, black or white, we are worthy of love and acceptance. Meet people where they’re at. Leave the judgment for God. Let’s all get along. Today I rediscovered the joy of running. One year ago today I bought my first “real” running shoes. 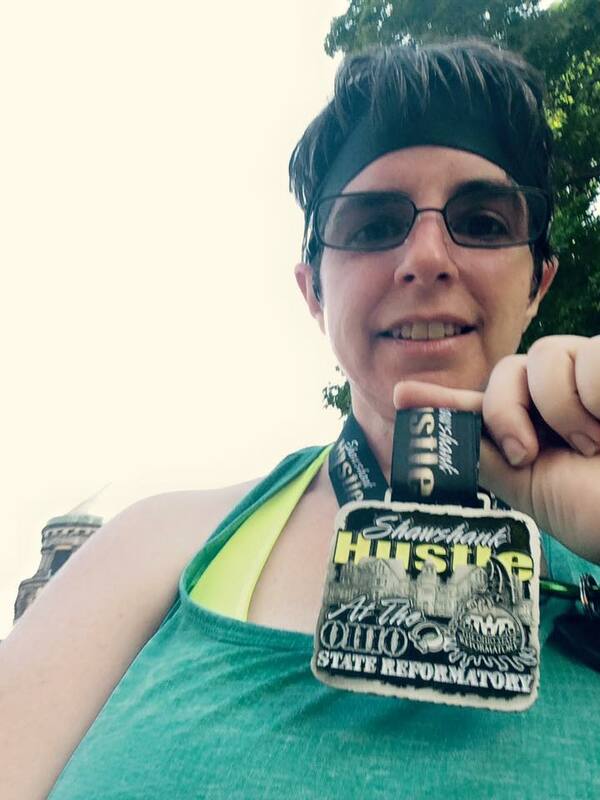 I was painfully slow, and filled with pain – both emotional and physical. With each mile I ran, I found freedom. For the first several months,all of my running was inside on the treadmill. there I could run in the safety of home, with my television for entertainment, the air conditioning and ceiling fan for comfort, the bathroom mere steps away, and an unlimited supply of ice water whenever I wanted it. I could run in shorts or pajamas. I couldn’t imagine running outside. That soon changed. As the weather became nicer, I decided to venture out to the local high school track. I couldn’t believe how different it felt. I hated every step that first trip. The wind made it harder to run. There were people there who might secretly (or not so secretly) make fun of me. They were all faster than me. They had nicer running clothes, too. I posted on Facebook that I didn’t think I would ever really like running outside. A friend commented that she wouldn’t be surprised if I changed my mind. She was right. I loved watching the scenery pass, and I loved the feeling of actually moving forward. I enjoyed the sights and the sounds and the sensations. Sometimes I ran with music, and sometimes I listened to the wind and the birds. Soon I was running at the track on a regular basis. I “branched” out and began running around town and on local trails. As winter fell, I found I hated the treadmill. I had fallen in love with running. Although I tracked my pace and was delighted to watch it improve, I didn’t focus much on my pace. 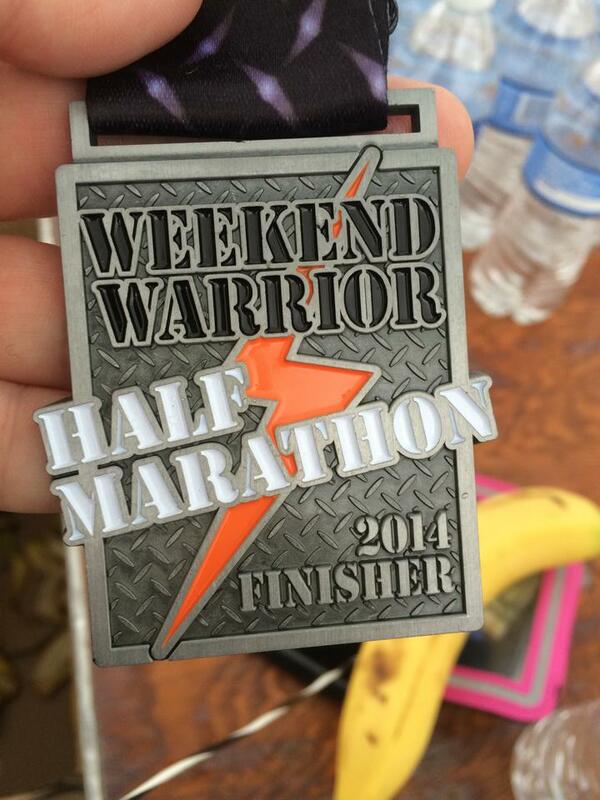 That all changed when I signed up for my first half marathon. I knew it was an ambitious undertaking. I had started as a person who needed to lose fully one half of her body weight. I couldn’t walk a mile without stopping. The race I signed up for had a time limit. I was slow (I still am). Not only was I asking my body to move much farther than it ever had before, I was demanding that it do so at a particular rate of speed. I began tracking my pace on every run. I tend to get a little obsessive about certain things. Soon I was running with three different apps open, each with a particular feature the others didn’t have. The joy of running turned into anxiety about a slower than average day, or the fact that I hadn’t improved over the previous week. 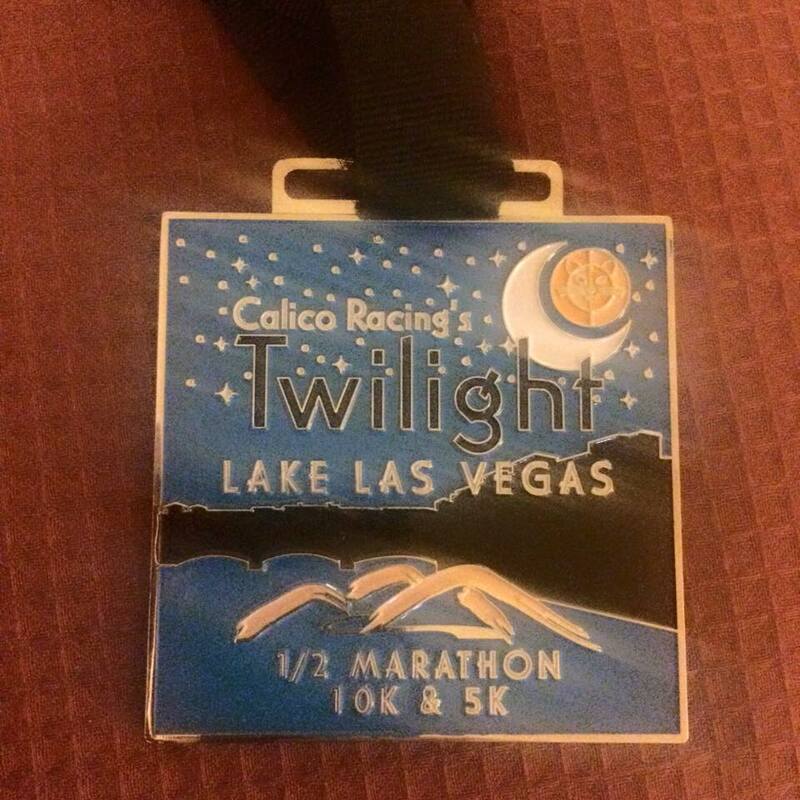 I pushed my body harder and faster, and when the race came, I still couldn’t keep up with the pace. I got swept. It was terribly disappointing. Upon my return to the gym, I downloaded more apps that did more things. I put a sensor on my shoe and obsessed about whether or not the apps were properly calibrated for the indoor track. I lost sight of the joy I had found and focused on the numbers as a measure of success. It’s been a long, cold winter. When the sun came out today, I went back to the high school track where I took that first outdoor run. 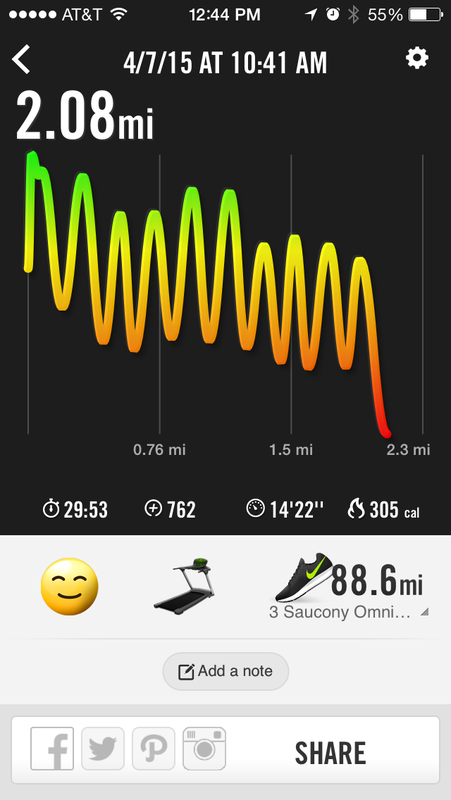 I turned on an app to track my pace, but I turned off the feedback about pace and distance. I listened to music. I ran “faster” for one minute, then “slower” for the next minute. I didn’t stress about my pace. When my run was finished, I looked at the stats. My pace wasn’t half bad, but that wasn’t what was important. I got out there. I ran. I burned calories. I sang. I had fun. I remembered why I started this running business in the first place.